James A. 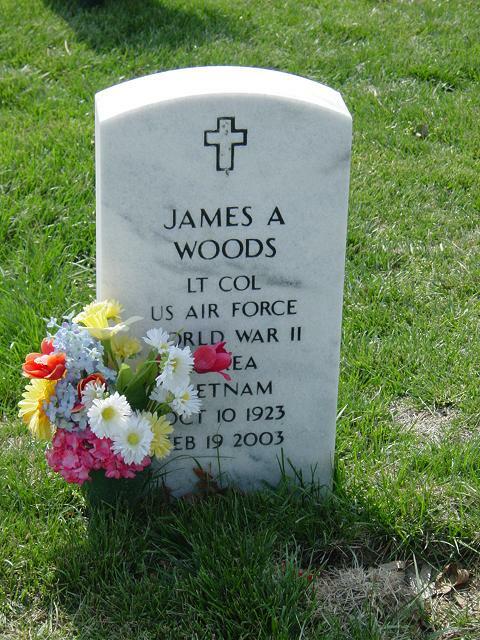 Woods, 79, a retired Air Force Lieutenant Colonel who flew in three wars and was later director of the Anne Arundel County office of inspections and permits, died February 19, 2003, at Southern Maryland Hospital after a series of strokes. Colonel Woods, who lived in Temple Hills, was a native of Pittsburgh. He attended Kansas State University. He served as a bomber pilot in the Army Air Forces in Europe during World War II. He flew 100 combat missions in an F-80 Shooting Star during the Korean War and flew troops into combat zones in Vietnam during the war there. He also supervised air traffic operations in Vietnam. Between wars, Colonel Woods was a flight test pilot. He retired in 1970 from Andrews Air Force Base, where he was staff pilot and pilot supervisor for the Air Force Systems Command. In addition to his work as inspections director, he was a consultant to the Anne Arundel County police and a land development consultant. He was a political adviser to Democrats in Anne Arundel and worked on county executive campaigns. He was a member of the Retired Officers Association and the Vietnam Veterans Association. He held two Air Medals and a Meritorious Service Medal. Survivors include his wife of 57 years, Jeanne Woods of Temple Hills; two sons, James Woods of Olney and Charles Woods of Chantilly; a sister; and five grandchildren. On February 19, 2003 of Fort Washington, Maryland. Beloved husband of Jeanne Woods, father of James A. (Lynneta) and Charles A. (Lorraine) Woods; grandfather of Stephanie, Megan, Andrew, Mark and Jonathan; brother of Annamay McGoldrick. Interment will be at Arlington National Cemetery on Monday, March 3, 11 a.m. with Full Military Honors. Family requests in lieu of flowers contributions may be made to the Vietnam Veterans Memorial Fund, 1023 15th St., NW, Suite 200, Washington, DC 20005.